I CNC’d a new handle to replace the broken one on the little lathe, but the new one made the old ones look a bit shabby, so they will all be renewed. The new, deeply waisted handles are very nice to use. The headstock shaft was 3/8″ and was a bit undersized due to wear, and I intend to use a collet chuck with a 10mm shaft, so I decided to increase the shaft size from 3/8 (9.525mm) to 10mm. 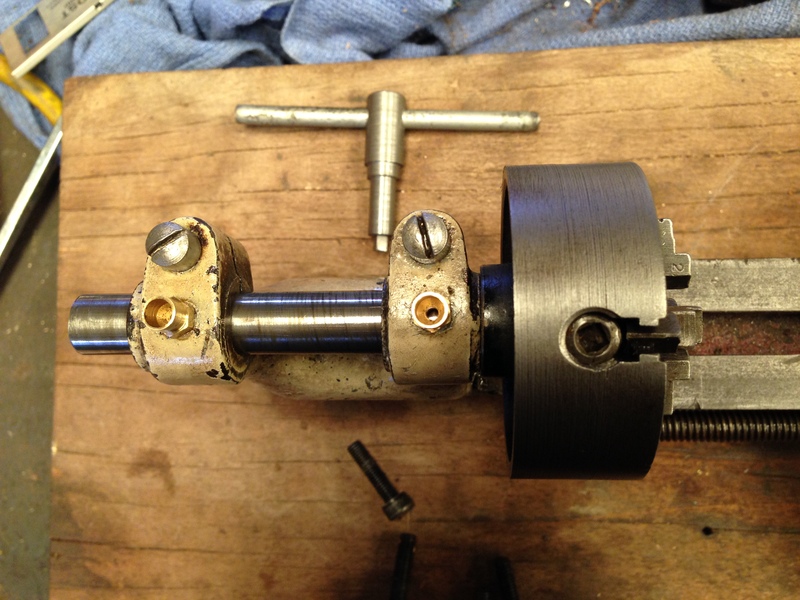 The headstock bearing housing is split, to permit some adjustment with wear. I used a reamer with spiral teeth to avoid the teeth snagging the split. And all seemed to go very well using the setup in the photo below. 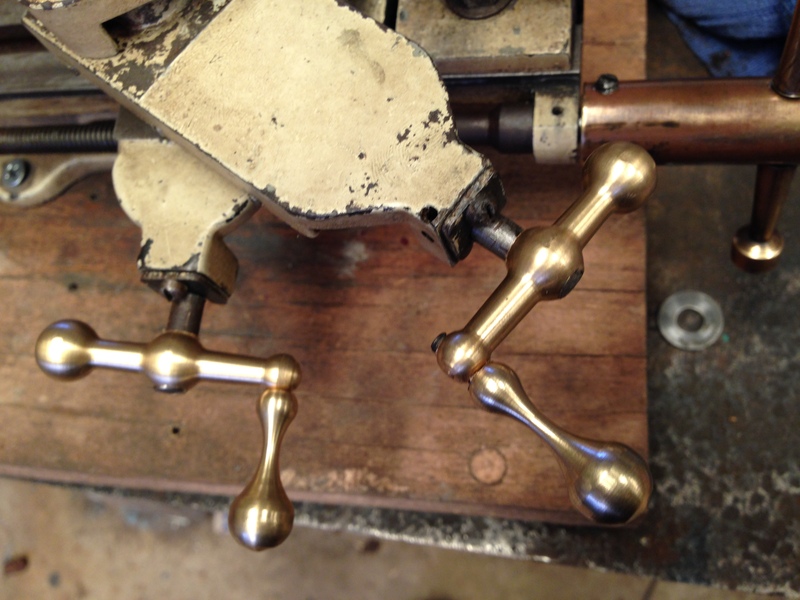 …Until I finished and raised the milling machine head out of the work. Due to my lack of familiarity with the CNC mill controls I activated the X axis rather than the Z axis. The side movement broke the reamer and partially gouged the newly reamed lowermost housing. Bugger. Bugger. What to do. Throw the whole project into the scrap bin? (following a few others). Change the shaft to the next size (12mm) and enlarge the housing holes to 12mm? That would thin and weaken the housing. And would be tricky machining. Also, due to the damage in a lateral direction caused by the mishap, I was not sure that drilling and reaming, or boring and reaming, would not follow the same lateral path. At least the uppermost housing was undamaged, so whatever tool was used would be held concentrically, as long as the cutting edge extended the distance between the 2 housings. So I very slowly drilled 11.5mm (the 11.5mm drill did span the distance between the 2 housings) and re-reamed to 12mm, again as per the above photo. Despite my misgivings, this time it all went well. The 12mm shaft is rather tight, and the housings will need some lapping. The housings appear to have enough thickness remaining, but time will tell in that regard. The lateral direction of the shaft is not perfect, but in such a small lathe that is not a big consideration. As a consolation, and to retore some self esteem after this muck up, I made a new chuck key. The chuck is held onto the shaft with a 3/8″ x 24tpi thread. That thread was cut on the CNC lathe, and is probably fairly accurate. The oil cups are spare from the beam engine build.